What is the secret to art that lasts forever and stays fresh always? Some say passion, some say rigorous discipline, some say ingenuity, and some say fungus. The last one is right. Anyone who has been to a museum knows the drill. Do not touch the art. Do not get too close to the art. Do not breath or sneeze on the art. You know what? Don't even look at the art too hard. Two blinks. That's all the culture you get. Move along. The curators of museums aren't being capriciously cruel. They're just well aware that absolutely everything in the world destroys art. Humidity from human breath or climate conditions warps it. Sun and light leech away color. Oils on skin or living things from unclean hands degrade. Fluctuations in temperature, like the fluctuations brought on by shoving a crowd of sweating people into a room by day and emptying that room at night, cause it to crack. Art is ephemeral, no matter how hard we try to preserve it. 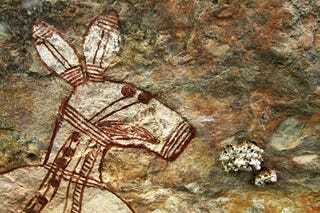 So why do rock drawings in Australia; subject to 40,000 years of extreme temperature, water, animal life, and the curious hands of humans, still look incredibly fresh? Why does the paint look new? Because there is no paint left. Testing has showed that many of the drawings have no traces of paint on them at all. What they do have is signs of life. These drawings were put on the rock walls with the spores of fungi and bacteria mixed in with the paint. The fungi, black in color, grew in the paint and exuded moisture. A colony of red bacteria, meanwhile, took that moisture and used it, producing nutrition for the fungi. Since each level of fungi grows on the last generation, the shape of the drawings stayed on the rock for tens of thousands of years, wind, weather, and all.